Before crappies move shallow later in the spring, they hold back in deeper water waiting for Mother Nature to send the right spawning signals. This behavior—sometimes referred to as staging before the spawn—occurs when the water is still cold and often murky from early spring rains. March and early April water temperatures in northern latitudes may hover around 50 Fahrenheit while farther south and in the lower Midwest a dunked thermometer may record a surface temperature around 60. In any case, you can subtract 5 to 7 degrees to get the temperature several feet down. Visibility in all but the clearest reservoirs may be only a foot or two, and in flood-control reservoirs, the murky water is also often rising. All of these factors tend to keep crappies back on their heels, so to speak. The females are full of eggs but still not willing to move towards the shoreline, and the males won’t go anywhere without them. Yet despite these neutral or even negative conditions, excellent catches can be made, for a number of reasons. First, prespawn crappies are truly hungry. And even though the water is cold, it has risen above winter chill. The spawning cycle that is about to begin also drives appetites, and, finally, the natural foods are becoming more available. But this early feeding occurs mostly in deep water where most crappie anglers are unaccustomed to finding fish and may not know how to make an effective presentation. First and foremost, tight-line trolling places slow-moving baits directly in front of the upturned eyes of deep crappies. Other advantages include covering more than one depth at a time and the ability to work more than one bait at a time. Tight-line trolling is a multi-rod presentation best handled at the bow of the boat. In Pennsylvania, where each angler is permitted the use of two rods, we deploy as many as six rods with three anglers in the boat. In states with less restrictive rod rules, one angler may tend as many as eight long rods at the bow, four to a side. Even where anglers are limited to a single rod, with two or three anglers in the boat, the technique can work well. A bow-mounted trolling motor is prefered for mainting the required boat control. When tight-line trolling, baits are worked on relatively short lines kept close to the boat. The bow lines normally drop straight below the rod tips and may even appear to bend back under the boat. 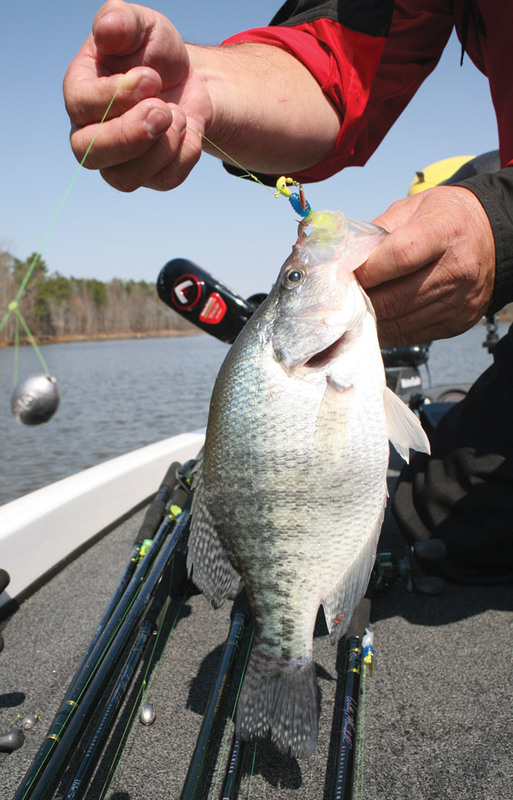 This is what makes the tactic different from basic spider rigging, a more common multiple-rod crappie presentation. Spider-rigged lines are positioned farther out from the bow as well as farther out from both sides and also behind the boat. Tight-line trolling is typically done with round, flat-head, or bladed jigs, though some tight-liners put short minnow plugs on the bow rods. Egg sinkers between 1/4-ounce and 3 ounces are added to the lines to keep them vertical and the baits runing deep yet at the front of the boat. To tie the rig, the egg sinker is run up the line before the bait is tied on. The line is then passed back through the core hole of the sinker, twice, and the double loop tightened over the long face of the egg. This secures the sinker in place. Other anglers may simply peg the sinker to the line with a toothpick inserted in the hole. Whatever works. The purpose of the weight is to hold the lure nearly directly below the rod tip at depths greater than what a small jig or bladed jig would swim without such a weight. Some anglers forego the sinker and instead just use a heavier bladed jig. Unfortunately, a heavier lure will also be larger with a larger blade, and I don’t believe crappies find them as appealing as the 1/4-ounce versions. The top bladed jig for tight-lining is the horse head Road Runner, which comes with an oval Colorado blade or a narrow Indiana blade. By design, Indiana blades run deeper, so these are most appropriate for a deep-trolling technique. However, Colorado blades produce more vibration and revolve at slower speeds, and some tight-line enthusiasts say they prefer this when the water is particularly murky and chilly. My suggestion is to try them all on an array of rods. Let the fish tell you what they want that day. Most bladed jigs come with a soft plastic trailer, and putting soft plastic on a jig that doesn’t have it usually increases the appeal. The advantage here is increased visibility in dark water, and contrasting colors really help in that regard. Most tight-liners like bright offerings, maybe a white plastic on a chartreuse head or a chartreuse plastic on a white head. Two combinations I’m particularly fond of are a white head with a black-and-white plastic and a chartreuse head with a blue-and-chartreuse plastic. Crappies may key on specific baitfish, but in my estimation, it is more a question of visibility than matching the forage. To select the best color or color combination, I tie various jigs onto the lines and drop them overboard. Whichever I can see deepest usually gets the nod. If the crappies don’t respond, then I experiment. Trailers for jigs include curl tails, paddle tails, multiple filament tube tails, and marabou tails. All have their days. The addition of a live minnow may seem like a no-brainer. But I’ve seen many a day when adding a minnow didn’t seem to have any real impact. Of course, there also are days when minnows are a big plus. Minnows add scent, feel and vibration to a plain or bladed jig. In all cases, the minnow is placed on top of the soft plastic, creating even more visual contrast. In lieu of live minnows, you may use a small piece of fluorescent putty bait, such as a Berkley Crappie Nibblet. The added color helps in dark water while the taste and feel may get a crappie to bite a bit harder, or at least hold on a little longer. The main consideration when selecting rods is length. All should be relatively long, with the shortest placed closest to the peak of the bow; progressively longer rods go down each side. Typically, the bow rod may be a 10-footer while the longest on each side is 14 feet. 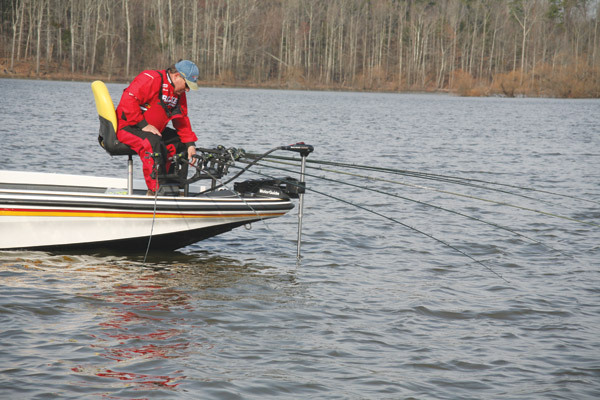 Best lengths depend on the boat and the number of rods being deployed. As a guideline, however, it’s probably wise not to go much shorter than 10 feet. I favor B’n’M Pro Staff Trolling rods, which come in lengths up to 16 feet. When setting out the rods, the shortest line also comes from the shorter center rod. And at no time do you want the line streaming back into that front-mounted trolling motor, so be watchful. The longer side rods are set with deeper and longer lines. Heavier egg sinkers on the longer side lines help to maintain straight lines at greater depths. Another option is to tie on two lures, especially on the longer side lines. With a space of 18 inches to 3 feet between baits, you can present two baits and cover more depths. Good combinations include two ball or flat-head jigs with minnows, a bladed jig and minnow on the bottom with a plain jig and minnow on the top, or both of these jig styles with no live bait. Key locations include creek and river channels in large bays, the flats adjacent to such channels, bridge pilings, points, and submerged humps. Where riprap extends out from a shoreline can be a very good location this time of the season. The shore area itself may be better when the water warms for spawning, but now, look for rocks strewn a considerable distance out from the bank in deeper water, though still connecting to the shore. The boat’s sonar plays a key role. The aim is to work every inch of submerged structure, often repeatedly. With a constant eye of the sonar screen, slowly sweep the structure with the baits. It’s a good idea to keep the trolling motor on one slow speed rather than revving it up and slowing it down, both of which can create commotion in the water that crappies don’t like. Play it slow and steady, and it’s surprising how often crappies go for the baits on the center rods, despite the close approach of the boat. A well-planned track that covers and repeatedly works the best structure is the final step in tight-lining. When you find fish, don’t stop. Instead, mark the spot, proceed beyond, and then return. As an early spring tactic, tight-line trolling is hard to beat.